Late on Day 5 of racing the Patagonian Expedition Race, it was clear that Bend Racing had maintained their lead and the media and RD headed out to CP5, located on beach looking out on to the Magellan straight. There was a full moon that shimmered above the icy blue waters. On the drive out, the RD mused that it might appear as though the route was easier this year because eight teams were still in the race at this late stage. However his analysis was that this is more a reflection of the collective experience of the teams; that they’d done their research and had solid skill sets. An off-the-cuff comment from one of the members of the Brazilian team Harpya XP Investimentos seemed to confirm the extent to which teams had analyzed the race. Team captain Fausto Silva said that the team had read every previous SleepMonsters’ report during their race preparation. Arriving at PC5 02:56, we found Barbara Bomfim’s husband Flavio waiting for her and her team, Columbia Vidaraid, to come off the trek. They were not due in for several hours, and leaders Bend Racing Yogaslakers had not arrived yet, but as Flavio is an adventure racer himself, he simply curled up in a ball in the large transition tent, heated by an open gas burner, and slept along with the rest CP volunteers. Shortly after 03:30 one of the volunteers called out in Spanish, “They’re here” and we stumbled out of the heated tent to watch the slow progression of the race leaders along the beach. We saw several headlamps sparkling in the distance and there was a brief moment of confusion; there weren’t supposed to be that many lights for a team of four. It was quickly apparent that the extra lights were simply from race photographers and the team, plus one. Scott Almendinger of their media crew had done the entire trek with the Bend Racing team and he arrived in a drenched, dazed state. The man in charge of the CP, Anthony, quickly took charge of the situation, telling everyone who was sleeping in the tent to get out as he felt that the team and Scott needed to change and eat quickly to avoid hypothermia setting in. The team said that the trek had taken longer than expected and that they’d run out of food six hours earlier. Lars said that they’d all twisted their ankles several times coming down the last stretch. He went on to say that about three hours into the trek they felt the dreaded foot fungus rearing it’s race ruining head. Indeed there is known to be a fungus here that racers can pick up on their feet and if not dealt with immediately, has been described to be one of the most painful experiences in adventure racing. Jason said that it starts with what feels like a simple grain of sand in ones shoes, something that you wouldn’t normally stop to take out, but if not treated immediately can quickly spread. He added that from his experience “ it lives forever in your socks and shoes” and that he’s used shoes he’s raced PER in, in other races and re-infected his feet. Lars picked up the discussion, saying that Chelsey had immediately known the symptoms when three of them felt the first impressions of a grain of sand and they stopped frequently throughout the race to deal with the fungal threat to their podium placement. This is one small example of how PER is a race that requires volumes of experience, down to the tiniest detail: a grain of sand. The team was deeply disappointed when they were informed that the kayak had been cancelled. They said that they had all been looking forward to the kayak section, with Chelsey saying that it was the anticipation of getting off their feet and into the kayaks that had helped them get through the monster trek. It was a special AR moment to hear their reaction; after pushing through what most adults couldn’t even imagine enduring, they sounded a bit like small children who’d been told they couldn’t go out and play; insisting that they do the kayak section. Most people would have been relieved after surviving that trek to know that a section had been removed, but adventure racers aren’t like most people. They had the choice to wait a few days until the weather forecast was better, as this section was merely suspended, not cancelled, but that would have meant giving up their podium. It was a short lived “tantrum” and then their inner adult took the helm once again and they slept a few hours until the dark zone lifted at 06:00. 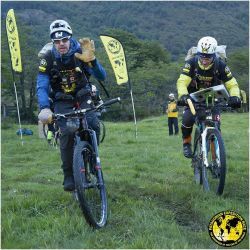 The team left CP5 at 08:35 to finish the job that they’d travelled to the end of the world to do. Two sections remain until the finish line at a ski resort outside of Punta Arenas. Travelling on their bikes first on an unpaved road, then on the main coastal road, they were greeted by a jarring sight; three pale naked bodies flinging themselves into the icy waves. At the sight of the unexpected nudists, they must have thought that the sleepmonsters had struck with a vengence! Further along the paved road, at 09;50, they took a cheeky pit stop at a road side police station. While Jason and Lars took a power nap in the grass, Chelsey and Alex went into the Carabineros de Chile subcomisaria rio seca reten Agua Fresca. In surprsingly good Spanish for this late stage of racing, Chelsey negotiated four cups of hot coffee with the Carabinier. He had no idea what PER was, he was just offering hospitality to four bedragled foreigners. Chilean hospitality at it’s finest. When Alex offered payment, he refused, so Alex paid him in homemade energy bars from back home in Canada. After ending their successful negotiation, they went outside to wake up the other two. When Jason groggily asked if Alex and Chelsey had slept, Alex told a bold face lie that will make every adventure racer smile in recognition. He affirmed that they’d slept on a couch in the police office for a half hour [it had been 5 minutes]. Chelsey ushered them in to the police station, saying that there was a surprise inside. Those four simple cups of hot coffee were the exquisite relief that the team needed to carry on to the finish. The team hopes to cross the finish line tonight and in so doing, seal the sweetest of victories and ending the longest of quests to win the Patagonian Expedition Race.